▶2 IN 1 4K HD CAMERA LENS DETACHABLE:YouCoulee clip-on professional 4K HD lens with 0.6X super wide angle lens + 15X macro lens for mobile phones,digital cameras.This perfect cell phone lens is suitable for photographers, travel lovers, it takes you to capture all the tine and wide scenry (travel scenery,wide landscapes) of the whole world in your cell phone. ▶0.6X SUPER WIDE ANGLE LENS: Widest angle Lens expand 60% larger viewing angle and expands field of view145°. 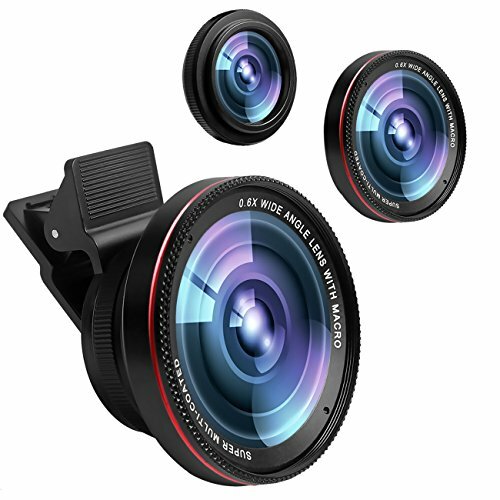 It opens up your field of view with a high definition wide angle image without distortion for beautiful effects. ▶15X MACRO LENS: Enables you to shoot photos at a distance of 1.18-1.57in from your object. More convenient and powerful to take clear and gorgeous pictures. Capture amazing close-ups in crisp detail. ▶HIGH DEFINITION & PROFESSIONAL: professional premium HD optical glass + durable aluminum alloy reduces glass flare & ghosting caused by reflections. Detachable soft rubber clip is easy to adjust and won't leave any scratches or marks on your mobile device. ▶WHAT YOU GET: 1x 0.6X Wide Angle Lens ,1x 15X Macro Lens ,1x Lens Clip ,2x Lens Cover , 1x lens cloth,1x Packing Bag ,1x Packing Box.We supply 2-Year Manufacturer's Warranty and 30 days no-questions-asked return policy.You are welcome to return it for a full refund if not happy with the purchase,which make your purchase absolutely risk-free and you can enjoy testing out it's quality and durability. If you have any questions about this product by YouCoulee, contact us by completing and submitting the form below. If you are looking for a specif part number, please include it with your message.